Our collection of solid wood shelving is the ideal storage solution: sturdy, hard-wearing and highly affordable. This range of wood kitchen shelves is easy-to-install, keeping countertops tidy and your recipe books close to hand. 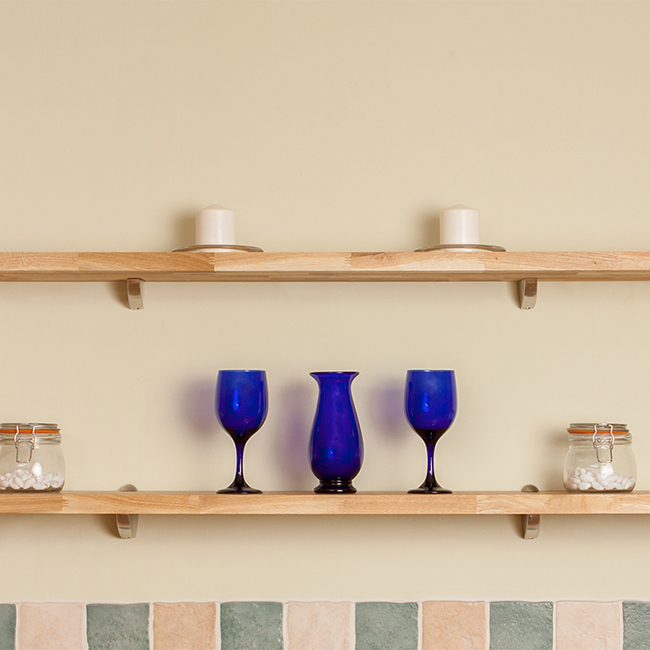 Made right here in the Cotswolds, these kitchen wall shelves are constructed from a series of 40mm-wide solid timber staves, which are finger-jointed and glued under high pressure to form a robust and visually-pleasing design. Each shelf is sanded to a super-smooth finish, before being treated with three coats of protective oil to nourish and enhance the natural beauty of the wood grain. More slender than our floating shelves, this kitchen shelving has a stylish, slimline appearance, and can be easily installed with the brackets of your choice (sold separately). These solid wood shelves come in a range of lengths and thicknesses, allowing our customers to find the best proportions to suit the unique dimensions of their kitchen. We recommend the use of two brackets to support 300mm and 600mm-long shelves, three brackets for 900mm and 1200mm shelves, and four brackets for our 1500mm-long shelf. All our timber is ethically-sourced and purchased from reputable suppliers with established replanting programmes. for storage that is full of character and built to last. Prices start at just £9.50.